The two beasts of Revelation 13. The first has seven heads, ten horns and a blasphemous name. Act 1, Scene 1, of the Fearful Drama of Two Great Apocalyptic Beasts. Le puede interesar: Church of Christ. Peace Publishers. Index B of moral, spiritual, Bible and religious materials in various formats. Le puede interesar: Bible prophecies. Past, present and future. Fulfilled, being fulfilled, or to be fulfilled. Seventh Beast. Seventh head-mountain-king. Identified. Remains for only a little while. “For the testimony of Jesus is the spirit of prophecy." The First Beast comes up out of the sea, a terrible creature with seven heads, ten horns and a blasphemous name. A. The first beast of Revelation 13 comes up out of the sea. 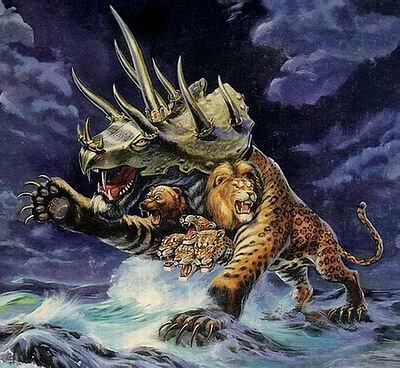 “And I saw a beast rising up out of the sea…” (Revelation 13:1). 2. What does the “sea,” or “the Great Sea,” symbolize in these visions? With much probability, because of similarities and settings in the texts, the same as the “many waters” mentioned in Revelation 17:1. “Come,” the angel says to the apostle John,“I will show you the judgment of the great harlot who sits on many waters.” Then, in Revelation 17:15, the angel explains: “The waters which you saw, where the harlot sits, are peoples, multitudes, nations, and tongues.” Though “Great Sea,” or just “sea,” in the visions of John and Daniel are, no doubt, an allusion to the literal Mediterranean Sea, also known as the “Great Sea,” the language of the visions is highly metaphorical, and consequently, an earthly sea is not really in focus, but rather what “sea” symbolizes in prophetical. Given that “sea” and “many waters” may be taken as synonymous, it seems logical to conclude that “sea” in these visions also symbolizes “peoples, multitudes, nations, and tongues.” At any rate, the beasts in Revelation are patently not literal and, logically, would not be coming up from a literal sea here on earth. That they would rise from among multitudes of peoples in different places and “sit” on them, as “the great harlot… sits” on “peoples, multitudes,” etc., is, indeed, exactly what they did, as shall be evident as we proceed. B. The first beast “…had seven heads” (Revelation 13:1; 17:3). 1. The identity of the “seven heads.” We find a very important clue for the correct identification of the “seven heads” in Revelation 17:9, where we are informed that “the seven heads are seven mountains.” This is the first explanation of the “seven heads” given by God through the angel that spoke with the apostle John. a) Not a few commentators maintain that the “seven mountains” are the seven hills on which Rome was built, but we respectfully differ for the following reasons. (1) First reason. One of the “seven heads,” synonymous with “seven mountains,” was “mortally wounded.” “And I saw one of his heads as if it had been mortally wounded…” (Revelation 13:3). Now then, if the “seven mountains” were the seven material hills on which the city of Rome was built, then it would be necessary to apply “mortally wounded” to one of them. “…wounded” as a literal hill? “…wounded” a mountain of earth or rock? How? When? Why? Wounded only one of the seven hills-mountains, but not the remaining six? Which one of the seven? These questions focus on some of the problematical factors arising when it is postulated that the “seven mountains” are the seven geographical hills where the city of Rome was constructed. Though “mons” (mountain) is applied by certain ancient writings to one or another of the seven hills of Rome, the truth is that the seven hills were comparatively low geographical formations. Today, they are no more than about 40 or 50 meters high [130 to 165 feet]. The “Capitolinus mons” measures 460 meters long, 180 wide and 39 high [1,500 feet long, 590 wide and 130 high] (Topographical Dictionary of Ancient Rome, por Samuel Ball Platner. Londres. Oxford University Press. Available on the Internet). 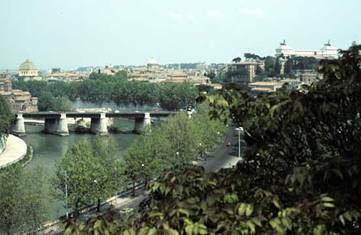 “The majority of the hills are mounds formed by currents of water that flow from the highest ground to the Tiber river.” (“The Seven Hills of Rome.” www.sight.seindal.dk). The two photographs that accompany this text clearly show that Rome is built on “hills” or “mounds,” and not on true “mountains.” While this reality is not determinative for the correct interpretation of the “seven mountains,” the distinction between “mountain” and “hill” is not, in our opinion, completely lacking in significance and weight. The city of Rome was built on seven hills and not on seven mountains. 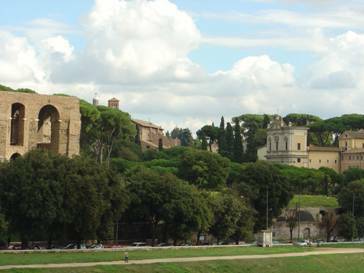 The names of the seven hills are: Palatinus, Capitolinus, Quirinalis, Viminalis, Esuilinus, Caelius y Aventinus. b) In the prophetical language of the Bible, “mountain” may signify “kingdom,” as, for example, in Isaiah 2:1-4. “Now it shall come to pass in the latter days that the mountain of the Lord’s house shall be established on the top of the mountains, and shall be exalted above the hills; and all nations shall flow to it.” “…the mountain of the Lord’s house” is the Kingdom of God. “…on the top of the mountains” signifies that the Kingdom of God is superior to any earthly kingdom, a truth also taught in Daniel 2:44-45, where it is prophetically revealed that the Kingdom of God would break into and consume all earthly kingdoms, lasting “forever.” So then, “mountain” and “mountains” in Isaiah 2:1-4 are clearly to be understood as “kingdoms.” The context of Revelation 17:9 indicates that we should interpret in just that way the noun “mountains.” That is, as “kingdoms.” This interpretation agrees with the second explication given by God himself regarding the meaning of the “seven heads,” which is as follows. b) We confidently affirm, then, that the “seven heads” of the beast that comes up out of the sea are, indeed, seven earthly kingdoms. Let us consider additional convincing evidences. According to Revelation 17:10, the “seven kings” are not contemporary but each follows the previous. Observe, patient reader, the fascinating sequence: five have fallen [past tense], one is [present tense, in the time when John received these revelations] and the other “has not yet come” [future to the time when John lived]. Indisputably, they are not contemporary, and this is determinative for the right interpretation of relevant prophecies. We can construct from this information a very strong syllogism. (1) First premise. The “seven kings” are not contemporary. (2) Second premise. The “seven kings” are the “seven heads” of the beast that comes up out of the sea. We emphasize once again: The sense of Revelation 17:10 is that five kingdoms have fallen, one kingdom is and the other kingdom “has not yet come.” “KINGDOMS.” Earthly kingdoms allied with Satan against the one true God and his people are the focus of these prophecies about beasts. The “seven heads” are seven earthly kingdoms. c) Daniel’s visions also contribute a very important detail for the correct identification of the “seven heads” of the beast John saw, to wit: the leopard Daniel saw “had… four heads” (Daniel 7:6). These “four heads” symbolize, indisputably, the four KINGDOMS that were formed from the territories conquered by Alexander the Great when he died in the year 323 before Christ. [Ptolemaic Egypt, Seleucid Mesopotaia and Central Asia, Attalid Anatolia and Antigonid Macedon] Given, then, that the “four heads” of the leopard are four earthly kingdoms, it seems altogether logical that the “seven heads” of the beast seen by John would be seven earthly kingdoms. The similarity between the visions of Daniel and John is quite evident and recognized; the prophetical language of both is very similar. If “head” symbolizes “earthly kingdom” in the visions of Daniel, “head” also symbolizes “earthly kingdom” in the visions of the apostle John. 3. The identification of the “seven heads” as seven different kingdoms that do not exercise full dominion simultaneously renders totally null and void the identification of the “seven heads” as the seven hills where Rome was built. How can “five have fallen; one is, and the other is yet to come” be applied to the seven hills? The seven geographical hills of Rome continue in the same place from remote times to the present. Five do not fall, leaving only one in existence, with the hope that another will appear in the future. The interpretation of the “seven heads” as an allusion to the seven hills of Rome is effectively eliminated as a credible interpretation. 4. The correct identification of the “seven heads” as seven earthly kingdoms, also means that neither do they represent seven individual kings. For example, seven individual Roman emperors. Therefore, it would be unnecessary to present additional arguments to prove defective the thesis according to which the “seven heads” would be seven individual Roman emperors. Nevertheless, we think it well to share with the studious the following considerations. a) Did only seven individual emperors occupy the throne of Rome? In reality, dozens of men occupied it across twelve centuries, from the early days as a small kingdom on the Tiber in the Italian peninsula to 330 a. d., when a new capital, the “New Rome,” was established in the East. New Rome soon became known as “Constantinople” in honor of its founder, Emperor Constantine I. More forms of government were implemented and many more emperors and kings ruled either all or parts of the total Roman Empire as it continued to involve on through the Middle Ages. The Eastern Roman Empire, called “Byzantine” only by historians, but not by the Romans themselves, continued to May 29, 1453, when it was conquered by the Ottoman Empire. The historian Edward Gibbons sets 1555 a d. for the effective end of the Holy Roman Empire in the West. b) We have already emphasized that the “seven kings” of the text follow one the other, not being contemporary. Reiterating: the revelation clearly says that five had fallen, one was, and the seventh had not yet come when John received this vision. Keeping these truths present in our minds, certain difficulties arise when it is postulated that the “seven kings” were seven individual Roman emperors. For example, which seven would the candidates be? The five before the time when John received the visions of Revelation, the sixth one being the emperor on the throne when John wrote the book and the seventh, well, the one that followed him? Should it be thus, in such a scenario, where would the eighth king come in, the ten horns, the little horn, the kings of the Orient, the great harlot, the “little time,” etcetera, etcetera? To be sure, some commentators have tried to solve this problem. Nevertheless, as we proceed with the development of these subjects, it will become clearer and clearer that the interpretation of the “seven kings” as “seven individual Roman emperors,” besides being annulled by the indisputable identification of the “seven heads” as seven earthly kingdoms, simply does not harmonize with the rest of the prophecies of Revelation on kings, kingdoms, distinct periods of time, etcetera. a) It is thus that when this phantasmagoric beast seen by John takes visible form in the world, manifesting itself as some earthly kingdom, it does not present itself with seven, fully developed heads at the same time. That is, it does not manifest itself as seven great, idolatrous, atheistic or purely secular empires that exist on the earth simultaneously. Rather, in each appearance of the “beast,” one of the “heads-kingdoms” predominates, standing out and imposing dominion for a determined time, each “head-kingdom” being distinct from the others, at least in some respects. b) The visions of Daniel that he received in Babylon during the first year of the reign of Belshazzar admirably support this interpretation. “And four great beasts came up from the sea, each different from the other” (Daniel 7:1-3). “…each DIFFERENT from the other.” Do we take due note? In Daniel’s visions, they appear one after another: a lion, with “eagle’s wings,” a bear, “raised up on one side,” with “three ribs in its mouth between its teeth,” a leopard, with “four wings of a bird” on its back, and also “four heads.” And lastly, “a fourth beast, dreadful and terrible, exceedingly strong. It had huge iron teeth… It was different from all the beasts that were before it, and it had ten horns” (Daniel 7:4-7). A sequence in the appearances of the four beasts is very obvious in the visions of Daniel, the sequential element being even more highlighted in the explanation given by the angel of God to Daniel, beginning in Daniel 7:17. 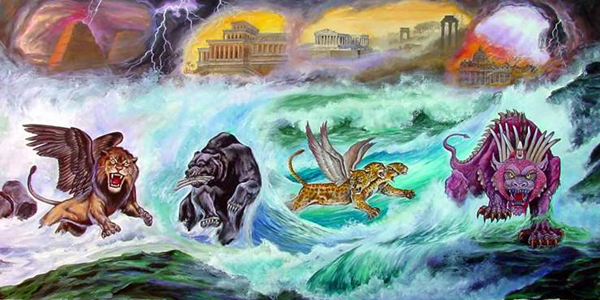 Each one of these four beasts corresponds to four of the “seven heads” seen by the apostle John in his vision as related in Revelation 13. 7. Given these evidences and considerations, once again, we affirm, with a high degree of confidence, that the “seven heads” are seven earthly kingdoms, each one of them as strong and fearful as a great, untamed beast, and that they arise consecutively. Interestingly, this same phenomenon is precisely what we find in the secular-religious history of that region of planet Earth where the visions of Daniel and Revelation play out. Seven different kingdoms, governed by forces, philosophies and beliefs opposed to the Creator God, each one acting out its part in the grandiose drama of nations, like a kind of ferocious beast that Satan himself might bring into being! 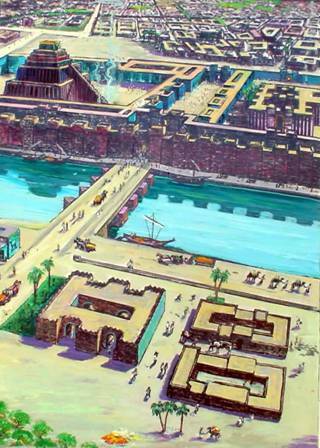 "Babylon in the time of Nebuchadnezzar"
By Joe Maniscalco. http://biblical-illustrations Rights reserved. With respect to their religiosity, these five great and powerful kingdoms were, essentially, idolatrous. Many of their pharaohs or kings were held to be “gods,” projected themselves as such and were the subjects of adoration. Definitely, the great “beast” gave life to those five kingdoms, sustaining them, as the body sustains the head. All that history reveals about them confirms this conclusion. b) The sixth kingdom is represented by the king that “is,” that is, by the one that was in power when Revelation was revealed to the apostle John toward the end of the 1st century. What kingdom dominated in that time? The Roman Empire. By the year 95 a. d., this head-kingdom had conquered Greece, Egypt, and many countries of less renown, forming a powerful, rich empire, of impressive geographical extension, of influential arts and culture, with a highly advanced legal system. It not only had its own gods and goddesses, including the goddess Roma, but had also freely incorporated those of other peoples. In addition, it practiced slavery on a grand scale, as also very violent sports in huge coliseums constructed in many cities throughout the vast lands of the empire. Surely, the sixth kingdom (sixth mountain, sixth head, sixth king) is the Roman Empire. Let us keep in mind that we can only ascertain the correct interpretation of the verb “is,” in the phrase “one is,” by placing ourselves in the time of the apostle John. “…is…,” that is, the king-kingdom-head that existed when the elderly apostle John lived on the island of Patmos close to the end of the 1st century, receiving there the visions of Revelation. John was saying, in effect: “The sixth kingdom-king-head exist in my time, in the time when I live, in the year 95 of the 1st century of the Christian Age.” Therefore, the verb “is” absolutely does not refer to the present time in which we live (the first half of the 21st century) but to the time when John received the prophecies and visions of Revelation. To the left, a standard with an eagle held high by Roman soldiers. 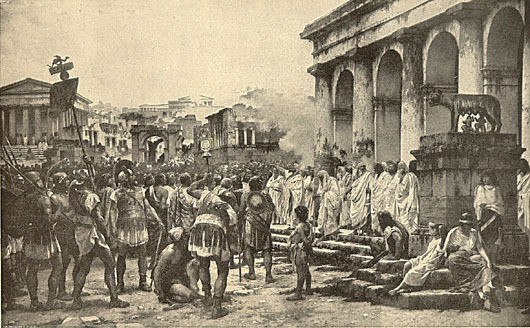 To the right, a group of Roman senators resplendent in white togas. On the large pedestal, the sculpture of the wolf that suckled Romulus, legendary founder of Rome and its first king. C. The first beast “had… ten horns; and on his horns ten crowns” (Revelation 13:1). In Chapter Seven of this “Analysis,” we thoroughly examine these “ten horns,” identifying them by name, and giving abundant evidence. D. The first beast of Revelation 13 is guilty of many blasphemies against the Most High. 1. “…and on his heads a blasphemous name” (Revelation 13:1). a) In the scene we are contemplating, “…a blasphemous name” appears over the seven heads of the beast. We propose that the “blasphemous name,” singular, symbolizes all the blasphemous names taken by the seven kingdoms across the times of their existence, names filled with fierce, belligerant pride that glorify human power; names of false gods, goddesses or demons. Governments and peoples of the seven kingdoms often esteemed the powers of such entities to be superior to the power and majesty of the only true and living God. In correlation, the “scarlet beast” is “full of names of blasphemy” (Revelation 17:3) “…of names,” that is, a plurality of blasphemous names. As a matter of fact, earthly peoples, nations and empires often have the custom of identifying themselves by names, nicknames or descriptive mottos and slogans that exalt founders, heroes, conquests, feats, legends or any other image they may desire to project. Some openly and proudly identify themselves with pagan gods or goddesses; others, with bold pretentions to military or commercial power, and still others with culture ideologies, special visions of the universe, certain moral codes or purely human life styles, some of them projecting themselves as if they were owners of all the earth, and not at all subject to the Supreme God, by whose will they exist, do and undo, though they do not believe it or care about it (Romans 13:1-7). “Fifth Dynasty and subsequent pharaohs were all known as “The son of Ra” and Ra became incorporated into every pharaoh’s name from then onward.” www.ancient-egypt-online.com/egyptian-god-ra.html Egypt is said to have identified itself among the nations as “Egypt, the Empire of Ra.” This identification constituted, in effect, a great blasphemy, for it elevated a false god, living only in superstitious minds, above the only true God who lives forever, and by whose sovereign will all governments are raised up, continue or fall. Even so, behind the superstitions, certain beliefs about the one supreme Creator God, the tree of life, the fall of man and the soul or spirit of man are discerned in the Egyptian writings about Ra, according to the above source. c) “…a blasphemous name.” Nebuchadnezzar, king of Babylon for 43 years (605 – 562 b. C.), dramatically exemplifies the haughty spirit characteristic of pagan rules. His very name includes an element of blasphemy, for the name of the false god Nebo figures in it. e) The blasphemous king Herod Agrippa permitted a multitude gathered before him to call him “god,” not refusing their adulation nor rebuking the idolaters who acclaimed him. “So on a set day Herod, arrayed in royal apparel, sat on his throne and gave an oration to them. And the people kept shouting, “The voice of a god and not of a man!” Then immediately an angel of the Lord struck him, because he did not give glory to God. And he was eaten by worms and died” (Acts 12:21-23). b) Declarations of having divine authority and attributes. c) Great boastings about power and accomplishments. 3. According to Revelation 17:3, the beast was “full of names of blasphemy.” Fundamentally, this beast represents purely secular, idolatrous or atheistic kingdoms. It does not represent any essentially “religious kingdom” associated with Christianity, a statement for which evidence is presented in Chapter Seven of this “Analysis.” Therefore, these “names of blasphemy” the beast takes are not the names of the apostate church, represented by the “great city-great harlot,” but names or titles taken by secular, idolatrous or atheistic rulers, who do not honor the true God, although they may pretend and assure the contrary. E. The appearance of the beast: “Now the beast which I saw was like a leopard, his feet were like the feet of a bear, and his mouth like the mouth of a lion” (Revelation 13:2). 1. “…like a leopard...” The leopard is feared and admired as a fierce animal, exceptionally agile and swift. Since the beast represents idolatrous, atheistic or purely secular kingdoms, this comparison of the beast with the leopard signifies that these kingdoms possess attributes like him. Historically, that is just how they have been: fierce, agile, swift in their actions against other nations, as well as against the true God and his people. 2. “…feet of a bear…” Because of its great size, brute force and ability to stand up on its back legs and run fast, the bear is much feared. Its claws are long and sharp. This animal can grasp, rip apart and kill without mercy. Applying the comparison, idolatrous or atheistic nations or kingdoms are accustomed to acting in the same way, one against another, against other types of nations, and against God and his spiritual Kingdom. They trod underfoot the name of the true God, violently uprooting his work and, with great impudence, profane and destroy what is truly sacred. 3. “…his mouth like the mouth of a lion.” What human being does not fear the proud, powerful lion? Muscular neck, large head, very wide mouth, long, sharp fangs with which they tear apart the flesh and bones of their prey. This beast can run very fast, pursuing its pray, pouncing on it, killing and consuming it. Applying the comparison to the “beast,” the history of our human race amply confirms that these same attributes are possessed by some secular, idolatrous or atheistic nations-kingdoms-empires forged through the centuries. Do they not thus treat weaker peoples and nations? Pursuing, persecuting and devouring? And history likewise confirms that this type of nation-kingdom-empire is likely to strike against the true God and his people, on occasion, with great violence, persecuting, even torturing and killing, determined to put an end to all who do not bow to their diabolical will. 4. So then, certain notable attributes of three distinct beasts come together in the beast seen by the apostle John. Summing up, this first beast of Revelation, fearful and terrible, has the agility of a leopard, the brute force of a bear and the aggressiveness of a hungry lion. Typically, these same traits are manifest, sooner or later, in great secular, idolatrous or atheistic nations-kingdoms-empires. As much in their ideological wars as in their military aggressions, they fly against their perceived enemies, sometimes with irresistible impetus and force, quickly devouring any who continue to resist, including even God’s elect if these choose not to cede to their demands, embrace their agendas, support their actions, give them honor and glory, double to their will. 1. The “dragon” is Satan. “So the great dragon was cast out, that serpent of old, called the Devil and Satan, who deceives the whole world; he was cast to the earth, and his angels were cast out with him” (Revelation 12:9). 2. According to Revelation 12:3, the “great dragon” also has “seven heads and ten horns.”Intriguing similarity, don’t you think? Why do both the great dragon and the beast have “seven heads and ten horns?” It is very doubtful that this circumstance is merely accidental. On the contrary, we reason that both have a whole lot in common, for they sustain the very same “seven heads and ten horns.” They would have then, we deduce, the same mind, mentality, goal, agenda. To be sure, we will see that both of them are bound together and tightly involved in the same evil undertakings, to the extreme that they share the same attributes and powers. The “great, fiery red dragon,” with his “seven heads and ten horns,” maximum leader of the “spiritual hosts of wickedness in the heavenly places” (Ephesians 6:12), makes himself known on planet Earth through the “beast” with his “seven heads and ten horns.” Both powers oppose the true God and his elect. We cannot, should not, miss the connection between the two, nor fail to understand its importance for humanity. 3. “The dragon gave him his power, his throne, and great authority.” How is it possible Satan could still have “power… throne, and great authority” during the Christian Age, for he was cast out of heaven in consequence of the “great battle in heaven” during the days when Christ triumphed oven him on the cross? The explanation is given to us by the Bible itself, to wit: He can have them only because Jehovah God Almighty permits him to have them, and because even during the Christian Age not only fallen angels but also hordes of human beings are willing to serve the Devil. a) “And he was given a mouth speaking great things and blasphemies” (Revelation 13:5). b) “…he was given authority” (Revelation 13:5). c) “It was granted to him to make war with the saints and to overcome them. And authority was given him over every tribe” (Revelation 13:7). d) Respected reader, do you see the implication of the phrases “he was given” and “It was granted to him?” Who gave, or granted, Satan those powers he exercises during the times of the beasts of Revelation 13? Who permitted him to have them? There is only one who has the authority to confer such powers: God, the Sovereign Creator. Therefore, it is to be understood that God is the one who concedes to Satan the authority to speak and act with limited liberty, from the time when he first rebelled against the Almighty to the present. Of course, Jehovah God, in virtue of his omnipotence, could well have totally eliminated Lucifer-Satan from all celestial environs when this fallen one first rose up against him, but he chooses to conserve his life, even conceding him authority and power for certain maneuverings on planet Earth, obviously with the purpose of testing human beings, as well as angels. The well-informed Christian will understand this purpose, while to the natural man bereft of spiritual knowledge and understanding it will remain an enigma. Until he too is converted to the Lord. “Now in the first year of Cyrus king of Persia, that the word of the Lord by the mouth of Jeremiah might be fulfilled, the Lord stirred up the spirit of Cyrus king of Persia, so that he made a proclamation throughout all his kingdom, and also put it in writing, saying, Thus says Cyrus king of Persia: All the kingdoms of the earth the Lord God of heaven has given me. And He has commanded me to build Him a house at Jerusalem which is in Judah” (Ezra 1:1-2). Did you take notice of the phrases “…the Lord stirred up the spirit of Cyrus king of Persia” and “…the Lord God… has commanded me…?” Behold here, a classic example of how God works in the kings of the earth, even in those who worship false gods, for the implementation of his own divine will, the which takes priority over any other will, be it of man or Satan himself. Peace Publishers. Index L of moral, spiritual, Bible and religion materials in various formats. Church of Christ. Index L of moral, spiritual, Bible and religious materials in various formats. Peace Publishers online.